Apple yesterday notified members of its iOS Developer Program that the company will be shutting down the iTunes Connect interface for the App Store over Christmas, preventing developers from accessing their app listings and scheduling releases during the December 23-28 window. iTunes Connect will be temporarily unavailable from Thursday, December 23 through Tuesday, December 28 for the winter holidays. iTunes Connect access will be back online for use on December 29. If you choose to set an available date for your app to go live during the scheduled holiday shutdown, your app will not go live on the App Store until iTunes Connect resumes for business on December 29. Please plan your releases accordingly. Apple's graphic states that iTunes Connect will reopen on the 28th, while the text of the announcement pegs the reopening as set for the 29th, and thus it is not exactly clear when developers will regain access to their app listings. A report from late last month had indicated that a similar shutdown would occur over the U.S. Thanksgiving holiday weekend in late November, but with Apple making no mention of such a shutdown in its Christmas notification, that does not appear to be the case. 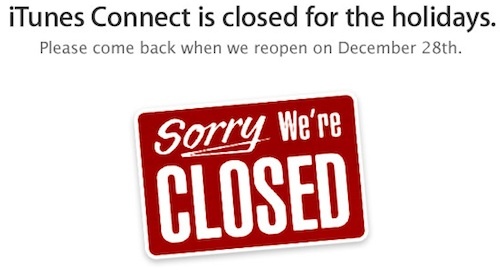 Apple offered a similar shutdown of iTunes Connect around Christmas last year.